Stand in the tanoak woods on a warm Autumn evening for the visceral definition of the season's shorter name, "Fall". All around is a percussive symphony of acorns falling through leaf and limb, finally collecting in patches and pockets and piles on the forest floor. What most people think of as decorations of the season we think of quite differently: food. Because when properly prepared, these make a flour as tasty as Chestnut flour. The trick is twofold: dry the acorns without overheating them, then use a slow cold water process to leach out the tannins. More on that in a later post. 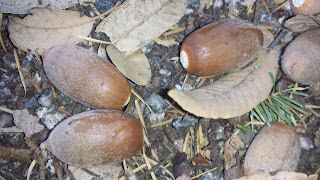 For now, gather them and spread them in thin layers in dappled sun at most, with good air circulation, for several weeks until the nuts are dry and hard. We shell them when dried and discard any with problems. The good nuts get dried more in a warm (not hot) air fan. We gather in October and November with drying done by late December most years. The abundance of bedrock acorn mortars in our area was my first unsubtle hint that these might be worth the effort. After several false starts, we seem to have this down to a stable process. In addition to Tanoak (Lithocarpus densiflorus), the Canyon, Valley, and Blue Oaks have excellent acorns - they all get the same treatment. Brunsvigia littoralis is an endangered bulb related to Amaryllis from the Cape Province of South Africa. Ours came from the U.C. Berkeley Botanical Garden fall plant sale years ago (more than a decade...). While habitat destruction is an important cause of this plant's endangerment, it has another problem: it is pollinated only by the longer-billed Malachite Sunbird (Nectarinia famosa). These birds perch on the flower stems and reach into the flowers for nectar, providing effective pollination. Malachite Sunbirds do not like disturbed habitats and areas altered by people, and are not known from California regardless. What is a plant to do? Enter the local stand-in for Malachite Sunbirds: our son. He has been pollinating these since he was two and saw me doing it. 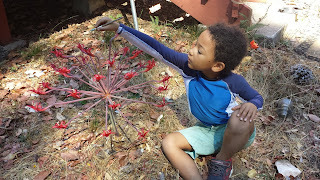 He is also the hand pollinator for pretty much everything he can reach this time of year - we grow several Haemanthus species as well as some other South African bulbs far from their native pollinators. He is great at it. Without hand pollination, we typically get one or two seeds per flowerhead. With hand pollination, we get thirty or more. In his words: "I'm not going to tell you". OK, perhaps he is protective of his methods. However, the basic game is getting the pollen from the anthers (where the yellow powder of pollen is made) to the stigma when it is able to accept pollen (the tip gets fuzzy and white). If the pollen gets where it needs to be at the right time, each flower can produce two to six seeds. These are not plants for impatient folks. From seed to flowering can easily be more than a decade. The bulbs are larger than footballs (American type) when ready to flower. They are worth the wait! In California they tend to flower in September, before the leaves emerge from the dry late summer soil for their fall and winter growth period. This year we are beginning to harvest the Fall fruit - Apples figure large in that process. 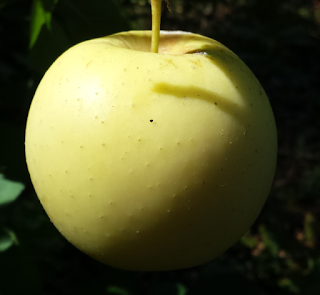 We have the first fruiting of three trees this year - White Pearmain, Honeycrisp, and Greensleeves. When buying apples at the store, they barely resemble their homegrown kin. I very much enjoy these apples - nevermore than when picked in fully ripe perfection straight off the tree. Honeycrisp was startlingly sweet, crunchy, and phenomonal. Perhaps it was even more so because I regularly eat this one bought from the supermarket, which sets a certain basis for comparison. An apple I had no basis for comparison with is Greensleeves. Indeed, after reading it's description, I had to simply find and buy a grafted tree, plant it, and wait. This is the tenth year of that process... and it was worth the wait. Greensleeves is a firm, smooth, sweet and tart apple with a great flavor. It is a yellowish apple of medium size.